Just before the close of 2017 I was the Tournament Director for the World Futsal Cup VI. It was the third time in the role at the event and the fourth time for USA Futsal as I held the same position at The World Futsal Championships in Orlando in 2016. The World Futsal Cup is an international youth championships and the VI Edition featured clubs from 5 continents in 5 age categories. 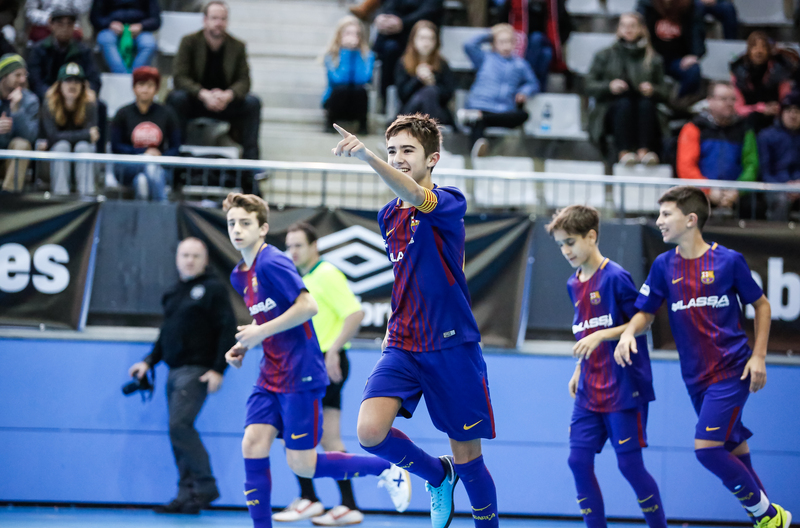 It is unique in the fact that you have teams from the world’s strongest futsal countries such as Brazil, Spain, Russia and Japan competing against each other at youth level. The only tournament worldwide that currently has a more global spread is the FIFA Futsal World Cup. In this post I want to discuss my experience in this role and it’s requirements and how the event has evolved. As a Tournament Director you are the ultimately responsible for what goes on at the event from the competition to the hospitality. I am more knowledgeable in the first area but, after four tournaments, I have came to develop an understanding of the latter and got more involvement in its supervision and execution. In the role you have to be prepared to do whatever task is required to ensure that everyone has the best experience possible. This can vary from helping design the strategy going forward, to solving problems with hotel rooms, inflating the balls to managing relationships with the sports arena and sponsors. This can mean very long days. With a small team delivering such a big international event, during the 6 nights of this event myself and the more senior staff were going to bed around 2.30am each night and waking up at 7am for 6 straight days. It was not nice to see how much time I had to sleep when setting my alarm each night. From the moment you woke up there was no time to relax and you are constantly running round, operating at your maximum for almost the entire day. Frequently, you would be answering a message on the phone while two or more staff members are simultaneously asking for help to solve an issue they were facing. There was also the added difficulty of constantly switch between English and Spanish. Prioritising your tasks correctly and maintaining a clear head is always challenging. The demands of the role are highlighted by how little of the action you get to take in. During the event there were 100 games at 22 different kick off times. Of the just under 900 minutes of futsal that it was possible to watch I probably saw a maximum of 20 and even then I wasn´t really concentrating on the action as my phone was constantly bleeping with messages and you are envisaging possible issues that might arise. Being organised, a problem solver and a hard worker are fundamentals attributes to succeed as a Tournament Director. Another is being able to lead. I had to manage a staff team of 25 including volunteers in different locations who are all working in a demanding and stressful environment. This is where relied on what I had seen work as a player as the intensity of futsal generates a similar environment. In this type of environment it is crucial to maintain composure and emotional control, and to manage situations without letting the stress and pressure affect you in order to transmit calm and find the best solution. Increased anxiety and tension don´t maximise performers output and will spread to others, escalating the situation and the likelihood of poor decision making. Once a problem has been resolved, it is the time to analyse and address the causes of the issue to ensure it doesn’t reoccur. These principles are the same for on court leadership. There is a general consensus that what you learn as an athlete has transference to being a leader in the workplace, probably because this the common direction people travel. What is less recognised is that it works the other way as well. The skills learnt as a player that I’ve applied to being a leader in another context have helped me more clearly identify and develop those skills further. There have in turn made me a better leader on the court. Due to my passion for futsal I have always been involved in projects during my playing career. Maybe if futsal had salaries like more lucrative sports I wouldn´t have been so motivated to involve myself in these and instead just fed my passion for futsal by watching games. Fortunately, this wasn´t the case and that I have been able to develop those leadership skills and many other things whilst still playing. For professional players in other sports this isn’t the case as I see on my UEFA Masters course where nearly everyone has solely focused on playing during their careers and they have missed out on these type of experiences. My idea when I took the Tournament Director role, and one that is shared by USA Futsal President Rob Andrews, was that the World Futsal Cup had to always provide a professional experience for the young players. Many teams came from countries where futsal is developing and they have a low quality environment to experience futsal. When they came to the World Futsal Cup I wanted them to feel like professional players and used my playing experience to think how I could achieve this. The World Futsal Cup is played in a stunning world class venue near Barcelona that cost 30 million euros to construct and has six full size courts all with ample spectator seating. We selected referees that had experience of professional futsal with two covering on the younger ages and three or four for the older age groups.The atmosphere during games was very good as fans brought drums and there was chanting from families and the clubs other teams participating in the competition. Creating that professional feel was also about little details for example having the players do a walk out from the tunnel and shake hands before games. Setting such high standards was not always easy. I’ll give you an example. One year, arguably the best player in the tournament at his age group got a straight red card in the semi-final. We had video of the incident and some would say that (I have to remain neutral!) it was a very debatable decision. The sanction would be a 1 game suspension meaning he would miss the final against FC Barcelona! I knew the coach of the team well and he was, as is to be expected, petitioning very forcefully and doing all he can to demand that he should not be suspended including making an appeal. It is very hard to stop a young child from having the rare opportunity to play a dream final against the biggest club in the world, added to the fact he was a paying customer accompanied by family members who had all flown in internationally. The referees understood his predicament and said it was a red card but asked our opinion whether the red card should be upheld. There was considerable pressure to recommend he was not suspended for the reasons stated. Should we make an exception to the rules? We rejected this opportunity to give our view and said if they thought it was still a red card after analysing the video then that is what it must be. They told me it was and I informed the team that their best player in the tournament so far would miss the final. I will leave whether the result of the final a mystery. I actually think the lesson that player was taught would have a more positive impact on his life than playing the final. He was taught that, even though the challenge was innocuous, if you lose control for a moment there can be significant consequences that you have to suffer. Hopefully, we made the right decision. This brings me on to another point about this tournament. 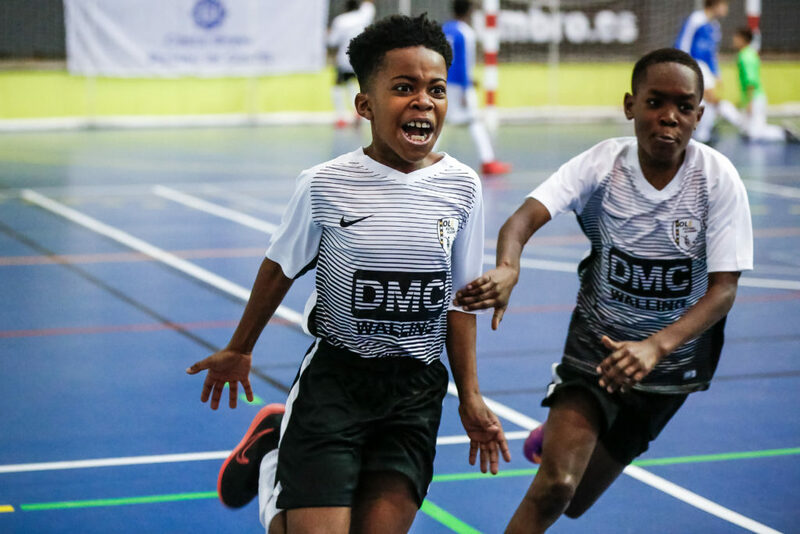 A lot of clubs initially come to the event because they believe it will significantly improve their players’ futsal performance. On this, they are certainly correct. They are challenged technically and tactically on the court, they leave having a reference of what is the best level worldwide in their age group, and they experience the day to day routine and demands of a professional player including the importance of lifestyle to recover for the next game. But they leave with a much more holistic benefits than just player development. The fact the children are in a new and, at first, unfamiliar environment shared with people from across the world that don´t speak the same language, but end up becoming friends, is of huge benefit to their personal development. 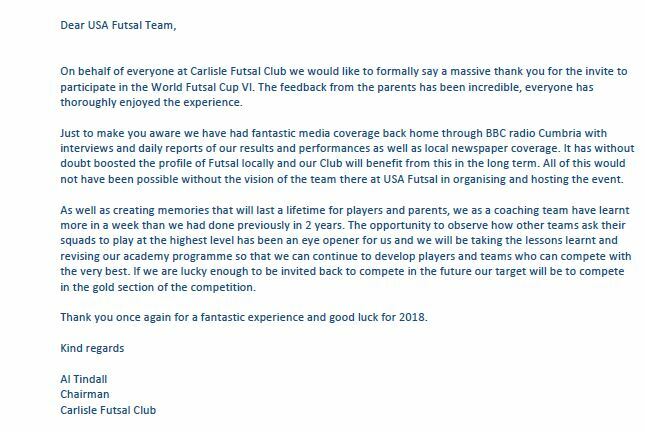 Further, it shows the type of experience futsal can offer, helping their motivation to commit to this magical sport. For the next edition I decided during the tournament that, with a heavy heart, this will be my last event with USA Futsal as Tournament Director. It has been an incredible couple of years which has taught me so much and gave me moments and experiences I will never forget. The biggest aspect I will miss is working with all the other staff members including volunteers that have been part of the team over my time. In such a pressured environment there are occasions when, inevitably, you get frustrated with one another. However, it is all forgotten quickly, the same as when you have disagreements as players on court. Fortunately, there are many more rewarding moments when you laugh together, have fun and share a feeling of pride and accomplishment. Of the staff during my time I would like to make special mentions to Carlos, Marcos, Nancy and Rob who I shared multiple events with and they became more than colleagues. I learnt so much from them and without their support we wouldn’t have been able to achieve what we did. I am really proud of how the team have transformed this tournament over those two years. When I started as Tournament Director the World Futsal Cup had 30 teams of which 16 were international. Two years later we had to increase to 40 due to demand and 30 were international teams. The global spread of the tournament has increased in that time with debuts since from Australia, Brazil, Colombia, Costa Rica, Croatia, France, Japan and Russia. The profile of the event has increased and we have had a few people come just to watch the tournament including from as far away as Africa (one disappointment is this is the only continent that still has yet to compete in the event). It is now a genuinely interesting event that has become worth traveling internationally to witness. Further, it attracted a globally renowned brand like Umbro to partner with us. Being English, one of the highlights was when Ole Futsal Academy won the Alevin division against FC Barcelona in 2016. Although I played no part in their success, to be able to contribute to providing the opportunity to demonstrate one of my beliefs that England can develop talented players with the right coaching and environment was satisfying. Out of 25 titles that have been won in the history of the competition, 15 have been won by FC Barcelona and only 3 by teams outside of Brazil and Spain which highlights what an achievement it was. The English club have now established themselves as one of the most respected at the championships. The ultimate indicator of how far the championships have come along though is the reaction of those involved during the event which highlights how special it is. Many times I saw someone score a goal and the players celebrated, those on the bench erupted, and the fans went wild as if it was a FIFA World Cup final. I saw grown men cry from winning and others get very emotional just from being able to participate and allow their players experience it. I told our staff that we should be very proud because we are helping to create memories that these children will remember for a lifetime. I have never witnessed such overly positive feedback, even if there is always room for improvement, as we received from this last event as you can see an example of below. It makes all the work over the last two years to get to this position worth it. Many youngsters play futsal with the ambition to make it as a professional. What they don’t realise is they are living the dream right now. I played professionally and, despite never playing in anything like these championships when I was younger, it was those times playing with my friends as a child that are still the most enjoyable of my career. The first year as Tournament Director was my debut organising an event like this and it was like being thrown straight in the deep end but with the help of the team I think we did a good job. There were lots of things I identified we could improve to take it forward. My second year in the role was a chance to trial the solutions I had for these. This third year was where we could refine these and start to think about the smaller details. The feedback we got this time demonstrates that we were starting to achieve our objective of providing an incredible experience for everyone. It will be a shame not to be involved next year when I feel we could put on an event that is almost perfect. The person who takes over will do a great job and I look forward to seeing them improve it further. Since the start I always had in mind to prepare everything so that the next person after me could seamlessly take over and have everything needed to replicate what we were doing. I am not sure why I took this approach but it is something that I will try to take into everything I do as it feels satisfying to leave some sort of small legacy behind. For Edition VII it would be great to come to the championships just as a spectator and enjoy all the up and coming talent on show without any stress or responsibility. There is a possibility I may help with the media next year which won’t require all the planning and work that goes into organising an event like this from scratch. It is probably the area where the championships needs to improve most as we have concentrated on the experience within the tournament and haven’t ever covered all the wonderful stories and action that takes place well enough. Personally, I will take all I learnt from these experiences into future projects and wish everyone at USA Futsal lots of success!